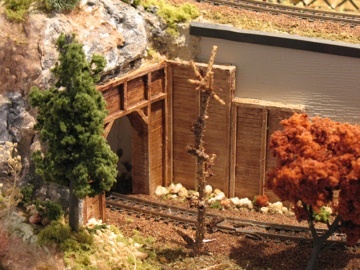 Model railroad tunnels and bridges should be a significant part of your planning process from the beginning and should be incorporated into your terrain as you are designing and building your model railroad layout. 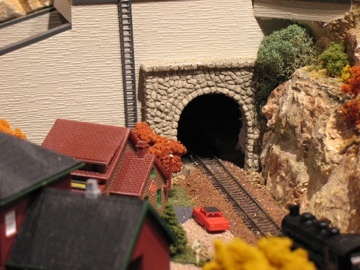 Model train tunnels are not only a necessity on most mountainous layouts, but also are very useful as a way of hiding your trains from view during part of their journey across your landscape. If your trains are in full view all the time, realism suffers. You want it to look like your trains are coming and going from somewhere to somewhere. If they appear from a tunnel or hidden valley, travel across your layout, and then disappear again behind scenery or into another tunnel, it looks like they are going somewhere besides just traveling around in a circle. You can either purchase or make your own tunnel portals. They can be found at most hobby shops as plaster cast forms simulating wood, cut stone, random stone, etc. and you can paint them with brown, tan or gray washes depending on your preferences. You could make your own plaster cast or resin cast if you have the inclination. Or use strips of basswood to create your own wooden tunnel using a reference photo. An easier thing to do is to use beaded Styrofoam that comes in boxes as packing material for other items. Use a ½ inch thick sheet of Styrofoam and cut it with a sharp knife to match the form of a tunnel portal. Make sure you have enough clearance for all your train equipment to get through the portal. If not you will have to make the opening bigger. Paint the portal with concrete-colored washes and then add a spray of gray or black wash to enhance the crevices. If you’re modeling steam, it would be good to also add a darker stain of gray or black to the top of the portal to simulate the soot left behind from the smokestacks as the trains enter or leave the tunnel. •	One way is to use a sheet of Styrofoam to cut and build the walls of the tunnel, which can be curved to match the course of track. Then cut another piece of Styrofoam to cover the tops of the walls. Then use wadded newspaper to create the mountain over the Styrofoam tunnel as described in the Terrain page. Cover the wadded newspaper with plastercloth. •	Another method is to cover the track directly with wadded newspaper, then cover the newspaper wads with cellophane. The next step is to open a can of Great Stuff and spray on a mountain over this cellophane-covered newspaper, leaving an opening on each end of the tunnel for the portal. Leave this overnight to dry. Don’t touch it after it’s sprayed out of the can ‘till it’s dry. Then reach in through the portal on each side and pull out the newspaper wads. The cellophane should keep the newspaper from sticking to the Great Stuff. You can then use a handsaw or serrated knife to shape the top of the mountain however you wish or add plastercloth to the top of the mountain to add texture and provide a good painting surface. •	A third method is to use the cardboard web technique as described in the Terrain page to form the sides and top of the tunnel and cover this with wadded newspaper and then plastercloth to finish the mountain form. Once again, make sure you have enough clearance inside your tunnels for all your train equipment. The inside of your tunnel should not be neglected, at least not the part that is visible from the outside. Take a piece of black, brown or gray cardstock, or construction paper, cut it to the proper size and insert the rolled cardstock into one end of the tunnel. Allow the cardstock to unfold and position it so that it creates rounded inside walls for the end of the tunnel. That way, when you look into the end of the tunnel, you only see black or gray walls instead of plaster or cardboard webbing. Place ballast or talus (small pebbles) on either side of the track inside the tunnel portal for as far in as you can easily see. Another way to do the inside of your model railroad tunnel is to use rock castings for the inside walls of the ends of the tunnel or use Sculptamold to line the inside walls and then paint it with washes as you would do with regular rocks as described in the Painting Rocks page. One important point to remember is the “Murphy’s Law of Model Railroading”, which states that “any track location on your model train layout that has little or no access is where the train derailments will occur”, especially on the inside of tunnels that you can’t get to. •	You can do this by cutting out an access hole to the inside of your tunnel area from the bottom, so that you can reach in from the bottom of the layout and grab the derailed cars. •	Or, when you create your mountain on top of the tunnel, place cellophane at the base of the mountain before using plastercloth or Great Stuff so that when the mountain is finished you will be able to lift off the mountain to access your track. •	You can cut a hole in the side of the mountain to provide access to the track inside the tunnel, and then cover the opening with a plaster rock casting or polyurethane rock foam cut to fit the opening. When this is covered with grass and shrubs, etc., the edges of the rock won’t be noticeable. Then, when you have a derailment, you can just pull the rock out, get the car, put the rock back in place, and fix the scenery a little again to hide the edge. Once you are finished making your tunnel, you can now place the tunnel portals on each end of the tunnel and fill in the spaces with Sculptamold. Incorporate rock castings above and/or on the sides of the portal if you wish. You may want to create a rock wall or retaining wall leading up to the tunnel on one or both sides. 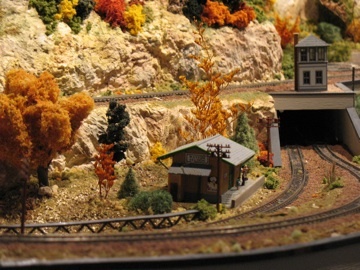 From "Model Railroad Tunnels" to "Model Train Scenery"
From "Model Railroad Tunnels" to "Homepage"